Favicon is an icon which appears with the name of a site. When you create a blog its icon will be the blogger's icon as it is a sub-domain on blogger. Favicon shows your blog a professional blog. (1). First choose a logo or icon which you want to add to your blog. (2). If you don't have any logo or icon create one at https://www.pixlr.com, make sure that the logo or icon you create has a transparent background. (3). When your logo is ready go to https://www.resizepic.com , choose the logo which you designed and resize its width and height to 32/32 because blogger doesn't accept bigger sized favicon. (4). Download the re-sized image and go to https://www.blogger.com. (5). Login to your account and go to Layout. (6). At the top of layout page edit Favicon and click on choose file now choose the re-sized image and click on save. All is ready now view your blog to see your custom favicon. I hope it was helpful if you have any problem ask me in comments. If you like this post take a second to share it with others. Follow and subscribe for latest news. 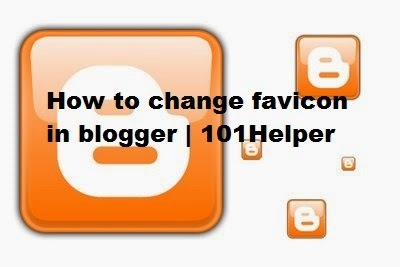 Tags: How to change favicon or icon in blogger | 101Helper, 101helper, blogger help, blogger icon change tips, blogger favicon change help, How to add custom favicon in blogger.